Here's the same promenade as yesterday but taken from the other direction. Today we are looking towards Italy - that's Cap Martin you see in the background. 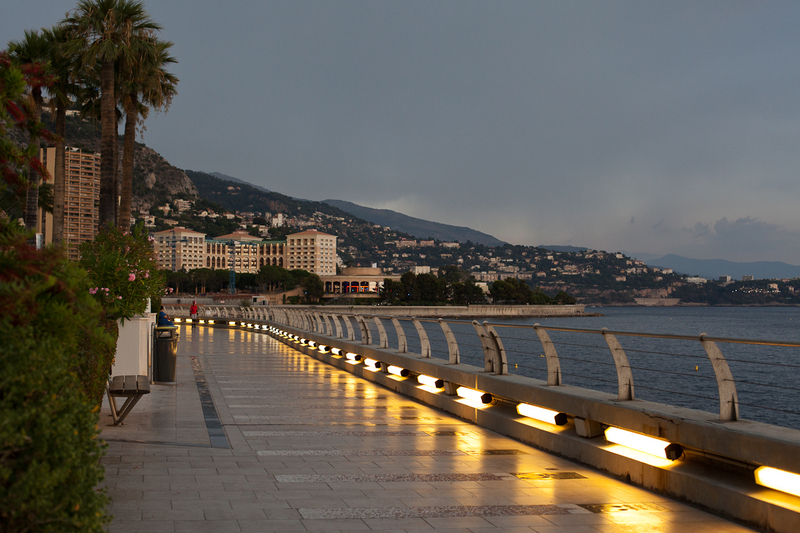 The large building is the Monte Carlo Bay Hotel and Resort. You can just about see plaques set into the pavement - below the lights, These are footprints of famous footballers cast in bronze. Click on the link to see what I mean. Each year one international footballer is chosen in the Golden Foot Competition for this honour. Based on our explanation, it would be my guess that the Monte Carlo Bay Hotel is, technically, not in Monte Carlo. I don't know if the bay east of Monte Carlo is still called Monte Carlo Bay, but I guess it is close enough. Any business that can use the name Monte Carlo I am sure wants to be associated with the glamour and cache of your location. Dave, absolutely it is in Monte Carlo. You are perhaps thinking of the Monte Carlo Beach Hotel which is in Roquebrune cap Martin - on land rented by Monaco. This is such a lovely walkway - I hope to walk there someday! Incredible photo! So in love with this place! I don't really care for footballers or their feet, but I could probably sit there for hours, just watching. These two photos are just beautiful. Yes, beautiful shots - I like the light hitting the wet stone. The background is gorgeous.